This month has seen our Construction division put the finishing touches to this major infrastructure project in Workington, Cumbria, on behalf of client Cumbria County Council. 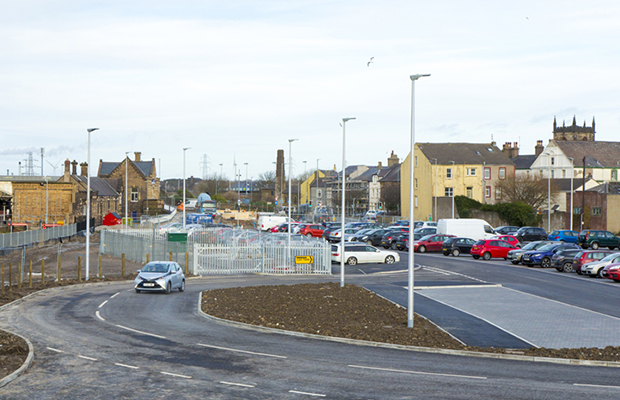 Commencing in Spring of last year, works were undertaken to build a new car park and develop the access area surrounding Workington Railway Station. The team have been working in collaboration with Cumbria County Council to deliver the scheme, which aims to encourage sustainable travel along the Cumbrian Coast and improve access to both Workington Railway Station and Cumbria Coast Railway. As well as encouraging rail travel, the project also serves to reduce traffic and create a more attractive appeal to the town. The first major milestone was reached in December when the new station car park opened to the public. Towards the end of the scheme additional works were undertaken to widen the existing footpaths south of the station to create a shared cycleway to further promote the use of the new transport hub. The project has been a good example of NEC3 collaborative working. Work on the site completed this week and Friday will see it fully operational and open to the public. Well done to everyone who worked on the project for their continued hard work and commitment to making the job a success.